It did not take me long to figure out that there are many records that I will never have. And, unlike some of my friends, who have not had this insight yet, I really enjoy all the compilations of rare and obscure records, that are released on LP and CD. Of course, there is nothing better than an original record in a good condition. But I want to hear as much music as possible before I die, so I thank everybody who releases compilations of stuff that I did not know to exist. It is absurd, but no matter how much music I hear, there is always more music that I have not heard yet. I often think that we are living in some sort of computer simulation, where past and future are illusions. The past is not gone, but something that is constantly being re-written. Our imagination is the inspiration for people in the past to fulfil our present desires. In other words: by imagining or desiring a record (or whatever), you inspire somebody in the past to actually create it. And also, by really liking a record (or whatever), you motivate all the people that are/were involved in creating that record, to do more effort. Because these people sense the appreciation for their product in the future as a motivation. This mechanism (which of course doesn’t excist, it is just an idea) creates a loop in time, that make certain things have more soul. It is our own soul, travelling through time. 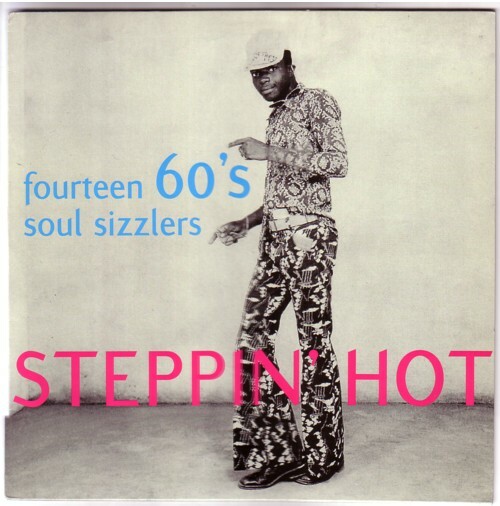 Anyway, a great example of a compilation LP with 45’s that I don’t expect to find in the places where I get my records, is Steppin’ Hot, a collection of fourteen 60’s Soul Sizzlers. I knew only one, Strange happenings by Rex Garvin & The Mighty Cravers. And if you know that one too, you have a pretty good idea of what the other 13 songs sound like. All songs have that same amphetamine sound, with little or no lyrics and a lot of loud drums, wild horn sections and pumping organs. The LP was compiled in 1999 by a guy who calls himself The Rustler. According to the text on the back of the sleeve, he was a deejay in the area where this LP came from. But I have no idea where that is, because there is no information whatsoever on the LP. Only music!